1. Every producer must know everything about the product movement to retail outlets. 2. Every distributor collects data about secondary sales in ERP daily. 3. We collect data about product movement throughout all distribution chains and integrate it in a central database – we open the black box! increasing of sales planning accuracy up to 85-90%. united achievement of higher business goals. 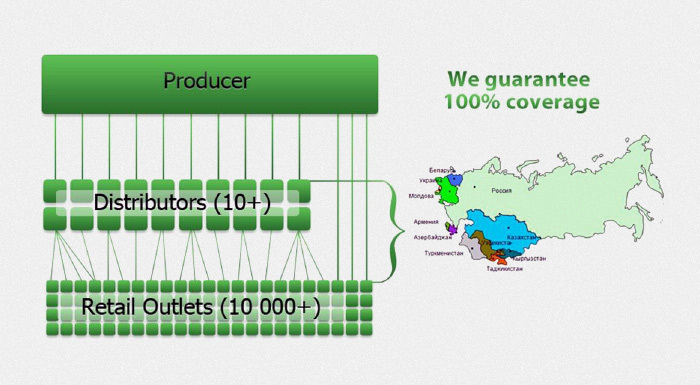 Reduction of internal costs for collecting and processing of information up to 100% with global improvement of its quality. * Based on clients performance after 1 year of SPOT2D usage. Retail universe coverage, distribution, TOP-products distribution. External data about retail outlets. SPOT2D – SaaS software, constantly developing from 2005. Database – MySQL (with replications). 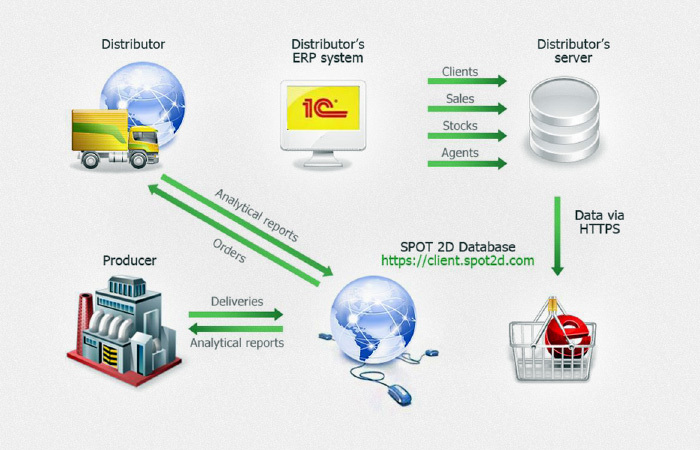 SPOT2D has its own methodology for data collection, processing and analysis. We provide constant support and upgrade of servers. Communication between all parties via HTTPS-protocol. – Amount of Data (set of accessible distributors and products). Logging and control of time and ip-address of every user entrance. Effectiveness for all distribution system! Optimal orders – No out-of-stocks – sales volume goes up. Information about products, clients and actions. Web-CRM technology – future now! On-line software update and support. Promoters, auditors – flexible reporting for any task. Route list, working day start and end. New retail outlet data input and visit to it. Retail outlet and contact persons data editing. List of retail outlets and visits history. Information about major contacts DOB. On-line data – On-line analytical system! Easy administration of any structure! Optimal monthly traffic per one user – from 100 Mb.